Our two best-selling books on home education are still available, either from Amazon, or direct from us. They outline some of the experience that we gained through educating our children at home for over fifteen years. 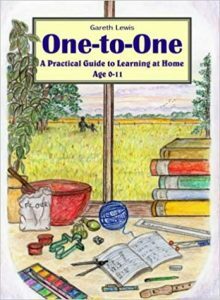 One-to-One covers the basics of reading, writing, and arithmetic, and also has sections on crafts, gardening, and cooking. It is designed to provide encouragement to parents who may be doubting their ability to teach their children at home, full-time, but it has also been used extensively by parents whose children attend school to some degree or another. Unqualified Education tackles the difficult question of what purpose education should serve in the life of a young person. Should it be about training for a job? Should it help a young person start to think for themselves? Are these two goals compatible? The book contains extensive sections on history and literature, plus extended sections on gardening, cooking, and crafts. 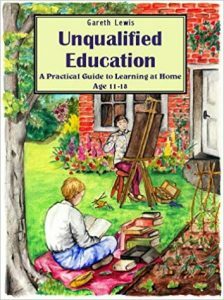 Unqualified Education – a practical guide to learning at home, 12-18. Since publishing these books, we have been working of our smallholding in Brittany, France. 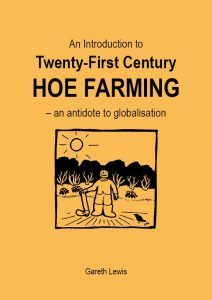 In 2016, we published ‘Twenty-First Century Hoe Farming – An antidote to globalisation’. It looks into the economics of modern farming, and the relatiionship between money, farm produce, and soil fertility. The book describles how to work an area of land by hand to produce food, fuel, and shelter for oneself and one’s family, in a way that is beneficial to local flora and fauna – whilst still leaving time to engage in paid employment or community activities. Income with compromise – is it possible? Education is about preparing a person for life. But there is a question which never seems to get made – what sort of life? There is obviously no point in preparing myself for a life I have no desire of leading. Judging from the current examples of my seniors, it would be foolish to want to embark on a similar life as them. I am lucky enough to live in a poor agricultural backwater, which had a farming boom at the beginning of the 20th century. It is easy to see the impact of the technological revolution on an area that was once fertile and picturesque. Yes, I can bury my head in the sand and join the ever thronging crowds in search of my ‘rung on the ladder’, or else I might be forced to take that dangerous step and rethink many of the pre-conceived ideas around in today’s world. I have had the idea for a while of writing something down about my experiences of life, post-adolescence. I was home educated for the entire duration of my school years. I was in fact probably among a small minority of children in the Western world who never attended a single day of regular schooling. I am now 28 (as of December 2015) and like the rest of my generation am struggling with the issues of survival in today’s world. I hope to write a few posts now and then to share my experiences and maybe act as a reference point for others in a similar situation. I am using the Freedom-in-Education website as my platform. It is a website me and my family created several years ago as an additional aide to our books on home-education. Sustainable living conjures up ideas of living in the country, growing vegetables, and keeping chickens – but a moment’s reflection shows that there has to be a lot more to it than that. Not only do certain basic functions, such as food supply, have to be sustainable, but also one’s interactions with the rest of the world. This obvious fact quickly leads to seemingly insolvable paradoxes. For instance, having children is clearly an integral part of a sustainable lifestyle – but not when you are incapable of bringing them up to live a sustainable lifestyle themselves. For this reason, this site does not just deal with issues such as gardening and building, but will also have articles about health, education, community, business, and government. Even if you grow all your own food (organically), make all your own clothes, use only renewable energy resources, and live in a hand-built shelter, you are probably just about as far from living a sustainable lifestyle as someone living a life of luxury in one of the world’s mega cities. This is because the human being is not the sort of creature that was designed to live on their own. Human beings have always relied upon their group to give them the upper hand in the struggle for survival, and the group is always stronger than the individual. Almost everyone has now been caught up to a greater or lesser extent in a single group that spans the world tying countries and continents together in a mind-boggling inter-connected web of finance, trade and global politics. On any day, and at any time, the lone green pioneer living quietly in some secluded corner of the globe could have their haven shattered by any number of possible activities initiated by the global population. This could include anything from a mining project to a tourist development; but it need not even be something specific to a certain location, it could be global warming, nuclear fall-out, or some form of widespread pollution. It could be a war, it could be tourism, or someone might simply be jealous and decide to come and rob them of what they have got. Furthermore, it is hard to think of any group of people, anywhere in the world, that has been able to protect its sustainable lifestyle when faced by an assault from the global community and its commitment to unsustainable living. As far as one can tell, there was a time when an individual’s chances of survival depended mainly on them being able to work constructively with the other members of their family or tribe, and this process seems to have worked fairly automatically. In larger societies, however, there has always been a need for a system of government that can resolve disputes and allocate resources without causing an outbreak of civil unrest. An effective government also has to be able to protect society from outside aggression. When a society has a government that is able to fulfil these functions, it will generally prosper. However, governments also are subject to a law of sustainability: if the cost of providing these services is too high, the society will eventually collapse. We are living at a remarkable point in human history, because the world population is for once not divided into a myriad of discrete populations, each under the rule of a separate government -and each capable of carrying on if another fell. Almost everyone on the planet is now bound together by a single financial and commercial system, and if it fell apart, everyone would be affected, and non more so than people living in developed countries. Ten or twenty years ago, it was not part of mainstream thinking that our technological world could be heading towards some form of imminent disaster. Since then, something has changed, and everyone is now worried about climate change, lack of economic growth, political extremism, and rampant greed and corruption amongst the elite. Few people now care to argue that we live in a sustainable economy, or that our economy could be made sustainable with a few tweaks and a few minor advances on knowledge already gained. The majority believe that we are caught up in an irreversible and accelerating descent into excessive resource consumption, environmental destruction, and society breakdown, which sooner or later will lead to a total meltdown of the global economy, and the sweeping away of everything that we associate with modern civilisation.